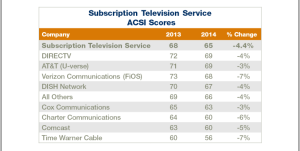 Home › Fiber Blog › AT&T, Comcast, Net Neutrality, Time Warner Cable › Does Customer Service Matter to ISPs? You would think that as consumers continue to trend toward cord-cutting, the pressure will continue to be placed on the subscription television services and the broadband providers to improve customer satisfaction to retain customers. 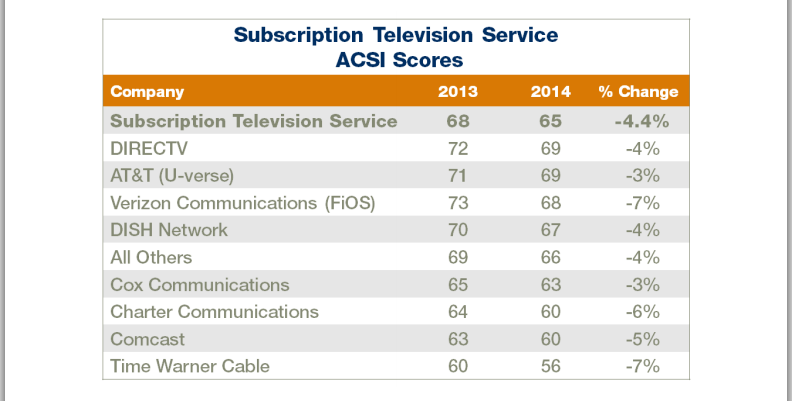 However, these same industries ranked lowest in the 2014 customer satisfaction ratings. Wouldn’t you expect to see high churn from these poorly ranked companies? An anonymous comment posted on Slashdot in early May 2014 referenced that consumers pay for more than they need on subscription television services and get less performance than they expect from their subscription broadband service. This should not happen in a competitive marketplace, but maybe that is the real reason… these industries are not in any significant competition. With the mergers of large companies, like Comcast with Time Warner Cable and like AT&T with DirecTV, the competition may be decreasing even more than it already is today. Service providers, rightly or wrongly, might have concluded that the investment in additional customer service, recognition or other soft processes is not justified by the consumer customer lifecycle, lifetime value of an account and profit margins for such accounts. But cord-cutting trends and new entrants into the ISP marketplace, like Google Fiber and Extra Mile Fiber, might turn things around to the benefit of all consumers.